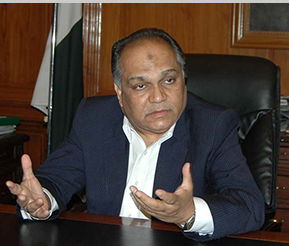 The business community expressed serious concern over the energy crisis in a meeting with Mr. Shoaib Ahmed Siddiqui, Commissioner Karachi on his visit to the Federation of Pakistan Chambers of Commerce and Industry (FPCCI). While welcoming the Commissioner Karachi Mr. Muhammad Ali, Acting President FPCCI highlighted the problems being faced by the business community due to lack of infrastructural facilities, power crisis and law and order situation in Karachi. He stated that the business community has been left at the mercy of the law breakers causing great panic in the business markets. He further emphasized on the need for frequent interaction with the Commissioner Karachi to overcome the problems particularly with respect to infrastructure. The main issues which came under discussion were water crisis, traffic congestion, load shedding, security, cleanliness, pollution and early completion of the under construction bridges particularly Lyari Express Way. Mr. Gulzar Feroz, Vice President FPCCI also spoke on the occasion; informing the Commissioner that the private sector is playing its due role but the government functionaries have not honoured their commitments, as a result there is a lack of confidence on the government functionaries. While replying to the queries, the Commissioner Karachi informed the members of the business community that he will soon organize a joint follow-up meeting of the business community with the representative of all concerned departments like KESC, Police, Karachi Water and Sewerage Board (KWSB), KMC, KDA etc at Federation House. He further informed that the Commissioner office is opened for the business community to resolve their problems. The meeting was attended by a large number of businessmen including Mrs Rukhsana Jehangir, Vice President FPCCI, Begum Salma Ahmed Shah, Mr. Dawood Usman Jakhura and Mr. Zakaria Usman Former Vice Presidents FPCCI, Mr. Siddique Sheikh, Advisor on CSR in FPCCI, Mr. Waheed Shah and Sheikh Manzar Alam Shah, Chairman Standing Committee on Press and Media FPCCI .